Pamela Simpson with her daughter Coral. In Laguna Beach, there is no cause too small—and no individual’s need too great—when it comes to residents’ willingness to help one another. Imagine this: You’re out enjoying a stand-up paddleboarding session along Laguna’s beautiful coastline, and then your entire world changes when you have a seizure, cardiac arrest and then drown. It doesn’t get much scarier than that—until you discover that you have a benign brain tumor that caused those medical calamities. It’s a blessing and a curse, and it was the fate of Laguna Beach resident Pamela Simpson, who was fortunate enough to live (thanks to Jason Mueller, a friend who found Simpson floating in the water and performed CPR), but whose future was turned upside-down following the May 2017 ordeal. 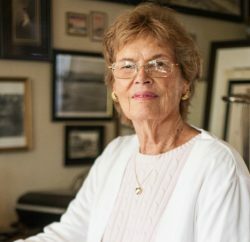 While Simpson’s health improved almost immediately after the tumor was removed, she was then met with mounting medical and daily expenses that were virtually impossible to pay off until she was fully recovered and working again. Another local, Lisa Early was diagnosed with stage 2 breast cancer after her first mammogram in 2013. Blindsided, she swiftly took action to beat the disease. She was employed, had employer-based health care and a positive outlook. And beat it, she did. However, Early also faced accumulating bills and expenses as she recovered from her treatments and surgeries. 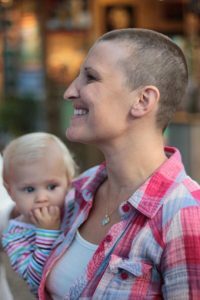 Two years earlier, in 2011, Brita Corradini was diagnosed with an aggressive form of stage 2 breast cancer at age 31 and approximately 6 months pregnant with her second child. Then, despite a clean bill of health in 2012, she was diagnosed again with breast cancer five years later—this time, it had advanced to stage 4. Brita lost her fight with the disease in May 2017, and is survived by her husband and local musician, Andrew, and children, 7-year-old Alabama and 6-year-old Ruby Corradini. For all three local women and their families, community members stepped in to help, whether offering financial or emotional support—or both. 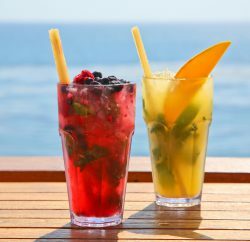 And such is the town’s character; habitually, Laguna Beach is a philanthropic community, and its sheer number of nonprofit organizations (more than 200) is a reflection of that. When a friend or neighbor is in need, magic happens. GoFundMe pages and auction fundraisers are common occurrences and just a few of the organized ways in which residents seize opportunities to help people like Simpson, Early, Corradini and their families. Additionally, Lagunans attend scores of charity galas for local organizations that work year-round to help the sick and homeless and, ensuring that the community-minded spirit is passed on to the next generation, to support and provide positive influences and experiences for children. Several good friends and fellow Laguna residents established a page on the GoFundMe fundraising website for Simpson while she was still in the hospital following the incident out on the water. 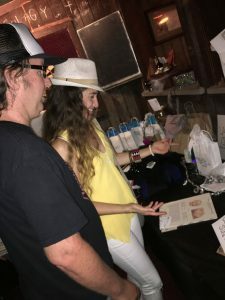 And an event that was organized to raise additional funds was held in Simpson’s honor at The Sandpiper, which included a large raffle with more than 60 prizes donated by local businesses. “They don’t call this The Village for nothing,” Simpson says. “The money raised saved me; I don’t have to worry about how to pay my bills while I recover. 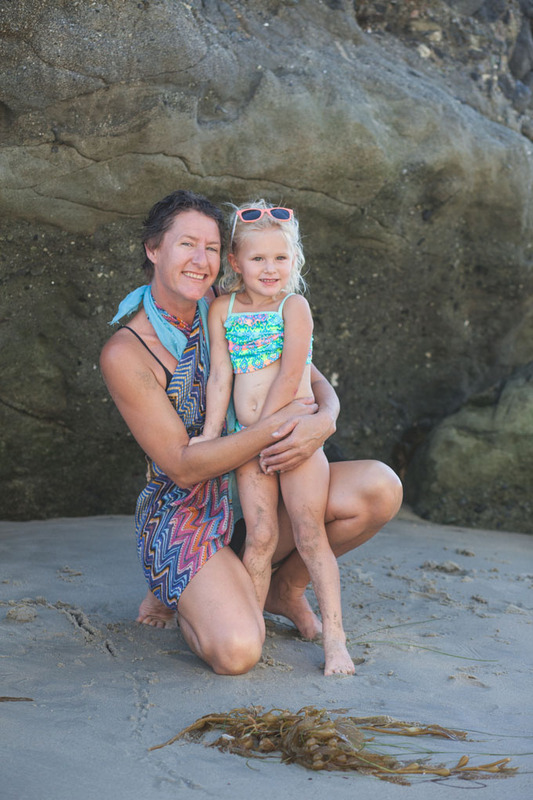 I’m excited to raise my daughter here and continue to call Laguna home.” Simpson also adds that her employer of more than 10 years, the Surf & Sand Resort (where she works as a bartender), was incredibly supportive during the ordeal as well. Community members peruse raffle prizes at a fundraiser for Simpson at The Sandpiper. Locals came to Early’s aid, too. With her familial support system in St. Louis, Missouri, where she was born and raised, Early relied heavily on her network of friends in Laguna. Friends and neighbors cooked her meals, or left flowers on her doorsteps, among countless other thoughtful gestures, according to Early. She also personally researched and discovered Orange County’s Breast Cancer Solutions to help ease her financial burdens. Notably, BCS paid half of her rent during the six months that she was undergoing chemotherapy. Early formed a committee of local friends to accomplish her vision of paying it back to BCS. The Laguna Gallery of Contemporary Art provided a space for the event, local restaurant Gina’s Pizza donated pizzas for the event, and many businesses in town gifted items for the silent and live auctions. Local band MoonShine performed for the crowd. For Brita, several GoFundMe pages were created and fundraisers held during the two times that she was undergoing treatment. With two children to care for in addition to her medical costs, every penny helped her family. Brita, shown here holding her daughter Alabama, passed away from breast cancer earlier this year. Andrew says he is grateful for the money raised, as it has helped him and his girls move into a new home; the rest will be put away for the girls’ futures. However, what struck him most over the years was the outpouring of love and kindness that he and his family felt. From kind words to meal trains to heartfelt notes of support, the Corradinis were astounded by the small gestures that made such a big difference. But it’s not just those faced with tragic medical conditions that are on the receiving end of Laguna Beach residents’ and organizations’ goodwill. The Friendship Shelter, incorporated in 1987, offers lodging and rehabilitation services, including mental and physical health care, to homeless adults in the area. The shelter also helps men and women overcome drug and alcohol addiction and obtain education and employment opportunities, among other services. Notably, more than 10,000 people have participated in one of the shelter’s programs over the last three decades, and 160 homeless people are offered a safe sleeping place and are cared for through Friendship Shelter each night. To support its mission to end homelessness in the community, Friendship Shelter hosts an annual fundraising gala, in which many Laguna residents participate. This year’s event, Back in Our Backyard, was held at the Laguna Cliffs Marriott Resort & Spa on Oct. 28, and, with the help of generous donors, raised more than $640,000. 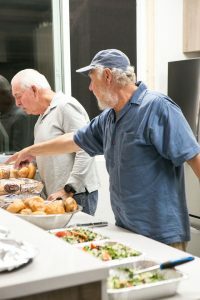 Additionally, Friendship Shelter relies heavily on its Guest Chef Program, through which volunteers arrive with groceries and recipes in hand to cook dinner for the 30 residents at its residential shelter on South Coast Highway and the roughly 45 residents at its Alternative Sleeping Location Emergency Shelter on Laguna Canyon Road. And Friendship Shelter also depends on supplies donated by community members, such as bedding, toiletries, clothes, over-the-counter medicine and vitamins. Volunteers help out at the Friendship Shelter. In 1952, the Boys & Girls Club of Laguna Beach was established with the mission to provide positive experiences for local children during their free time after school, while teaching skills and behaviors that help set them up for future success. 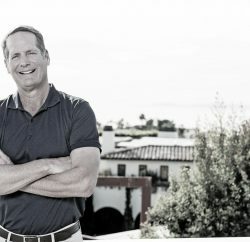 Since then, the organization has grown from one Laguna Beach location to three sites around town with 50 people on staff. Wilbur explains that the clubs connect with local youths by maintaining strong relationships with area schools through things like lunch programs and by interacting with the kids daily. And it’s not just the club’s staff and volunteers that are looking out for our local kids. According to Estes, the 2017 Boys & Girls Club of Laguna Beach budget was $2.6 million. About one-third of that was raised through program fees, but the rest was obtained with the help of the community, through both fundraising events and donations. Two of the club’s larger, well-attended fundraising events in 2017 were Night at the Ranch, held Sept. 22 at The Ranch at Laguna Beach, and Girls’ Night Out, held Sept. 28 at the home of Laguna residents Holly and David Wilson. 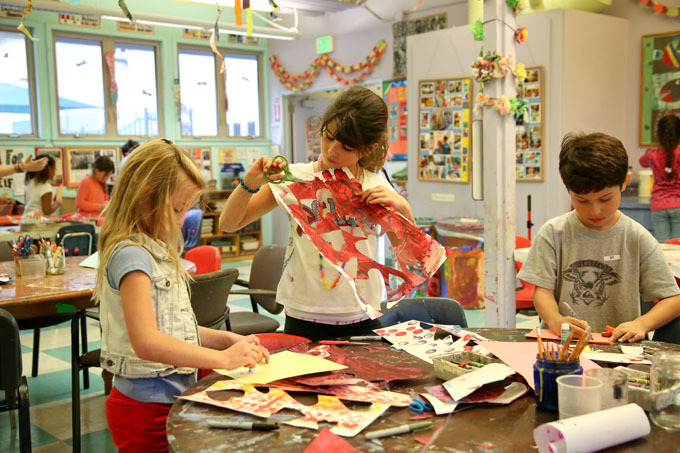 Children work on art projects at Boys & Girls Club of Laguna Beach, a nonprofit strongly supported by the community. And fostering that strong sense of community is, of course, what will guarantee that the next generation of locals is looked after and cared for in the same way, too. Two of the town’s art festivals boast special funds reserved for those in need. Laguna Beach teems not only with community-minded organizations and citizens, but also with artists—so it’s no surprise that they, too, are on the receiving end of the town’s support when it comes to growing their careers or when they’re faced with troubled times. Both Sawdust Art & Craft Festival and Festival of Arts cultivate funds to assist artists, enabling them to continue to support themselves, especially in spite of illness, tragedy or unexpected hardship. The Artists Fund at Festival of Arts, established in 1998, provides financial support to past and current FOA artists while they recover from short-term emergencies, financial difficulties or natural disasters. Artists may also request assistance to cover necessary medical treatments or scholarship grants to help advance their careers—by enrolling in special workshops or classes, or purchasing new equipment or supplies, for example. A large source of capital for the fund is the annual Art-To-Go fundraiser, whereby festival exhibitors donate original works to the event’s silent auction, the proceeds from which benefit the fund’s disaster relief grants. To date, the organization has distributed more than $180,000 in grants to help artists. (theartistsfund-foa.org).